Entoma is a member of the "Pleiades Six Stars," the battle maid squad of the Great Tomb of Nazarick. She was created by Genjiro. Entoma has the appearance of a girl wearing clothing similar to the traditional Japanese style. Her eyes are cute, but they never twinkle or blink. She has brown hair with twin chignon. She never exposes bare skin except her face. Her true form is an arachnoid. Her face is a mask-shaped insect and her hair is formed from an organization similar to a rolled centipede's. She also disguises her voice with that of a cute girl by using a leech that steals human victim's voice. Her original voice is harsh and grating, similar to that of Cocytus. However, she does not like her original voice, so she becomes quiet when she loses her fake voice. 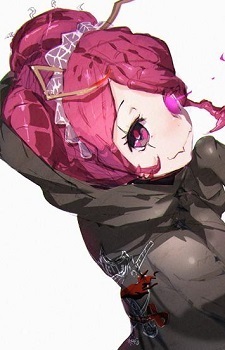 Entoma likes to eat humans, her favorite part being the muscular arm of men, though she doesn't mind what kind of person she eats if she is given an opportunity. If there are no humans to eat, she eats snacks called "green biscuits" instead. Despite treating humans as food, Entoma's nature is not considered extremely evil. If she comes across humans when she is sated and they do not bother her, she will ignore them rather than eat them.